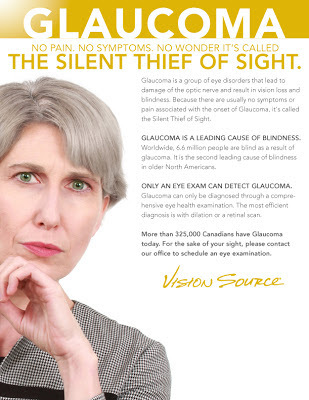 Research published in the June issue of the Journal of Ophthalmology shows that Canadians are not taking easy steps to protect themselves against glaucoma. The study found that 50% of those who are newly diagnosed with the disease are already in the moderate to advanced stages of the disease. By this time they have suffered irreversible and often devastating vision loss. Early detection is key because if caught early glaucoma can be managed and its progress halted. But there are virtually no symptoms in the early stages of the disease. That is why early detection is only possible through a complete eye exam by an optometrist or ophthalmologist. The obvious implication of the study is that Canadians are not doing enough to protect themselves against glaucoma. Everyone should have an annual eye exam. Keith Henderson, 62, a retired millwright in Alvinston, Ont., is fortunate. Ten years ago his brother was diagnosed with advanced glaucoma, which prompted Henderson to see an optometrist and request extra vigilance. Extra tests — which he had to pay for — showed he had high pressure. He eventually had prophylactic laser treatment to relieve the pressure. “I won’t lose my eyesight to glaucoma because of what has been done,” says Henderson. Henderson’s brother, Larry, now 65, is just about completely blind now, he says. The factory worker, was 55 when diagnosed, didn’t know to get regular exams. Diagnoses before there is vision loss is key. For patients, who catch it early and are diligent with treatment, vision can be preserved, Buys says. Too many are doing it too late. “In a country that boasts of universal health care, our patients are coming in with already serious and significant loss of vision,” Hutnik says. While we have a health care systems that calls itself "universal", eye exams are not covered. Yet, as the story above demonstrates, they are critical. The rationale for not insuring critical health services is often founded on the principle that people must have personal responsibility for their own health. For whatever reason - lack of knowledge, lack of resources, lack of awareness of what can go wrong with their health - too many people are not doing the right things. I hope some of them will read this blog post and make an appointment with their optometrist.